Easy to forget when you're stuck in our sleepy real estate market, but the rest of Canada has been going gangbusters while we were stuck being boring. The little upward blip in July saved us from last place (that honor going to Edmonton), but over there the market is pretty hot with 3.3 months of inventory in July, while we sit at 8.2. Some friends of mine sold their house in the past month or so. They'd owned it for not quite four years. From purchase price to sale price they got about 20% more. Crazy considering they hadn't done anything significant to the property other than slap on fresh paint and replace a small rotted deck. Individual house transactions can be completely disconnected from 'the market' eh? Strong start to the month with 16 sales/day compared to 13 last year, and fewer listings this year. Looks like the recent mortgage tweaks were necessary to beat down a resurgence in this market. Beginning of month predictor said 477 sales, but it seems the market is up for a late summer hurrah. Despite collapsing sales after our mortgage changes last July, prices have stayed on a relatively sedate course in Victoria. Declining slowly at a couple to a few percent a year, but stubbornly holding out against a whole year of inventory. 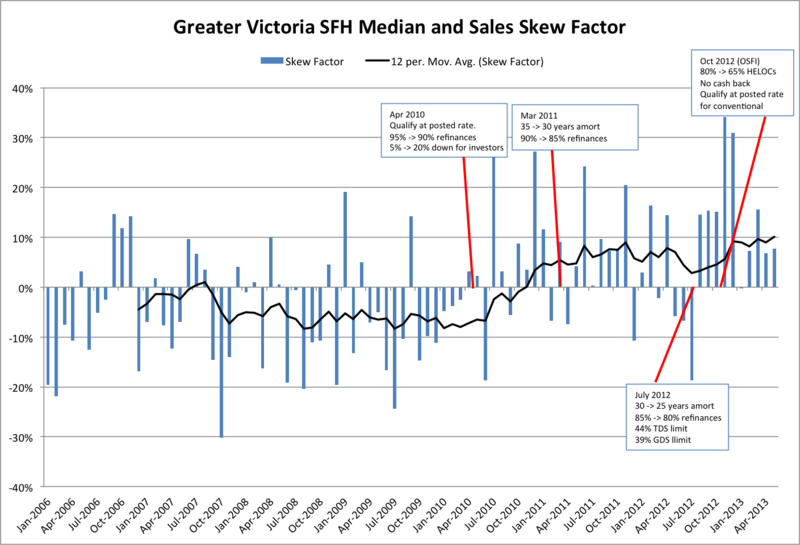 Regular commenter info has raised the issue of the prices being skewed upwards by the sales mix, with the mortgage rule changes having taken out the buyers on the low end, and thus having a larger proportion of higher end sales. To test this theory it requires another look into the regional data kindly extracted from the VREB monthly reports by koozdra. 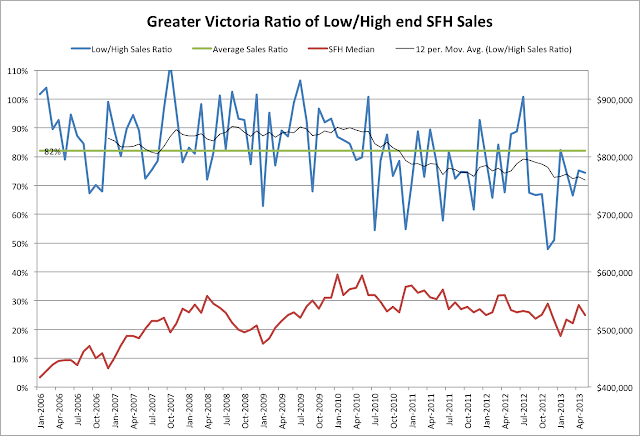 The VREB divides sales into 19 regions, some of which have very little activity, and trying to compare the sales mix individually by region would be quite messy. 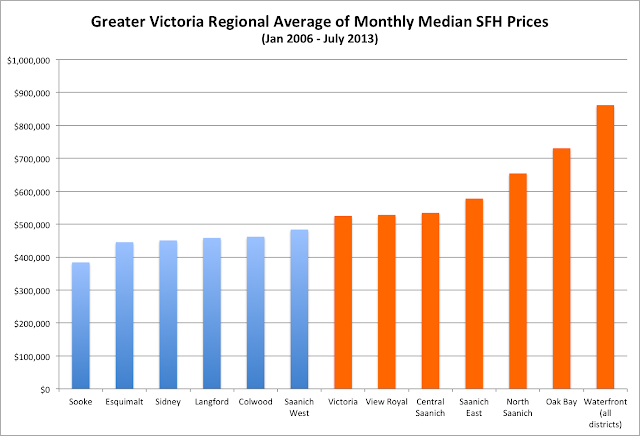 Info simplifies the comparison by considering the mix between the sales in the lower priced regions (defined to be Esquimalt, Colwood, Langford, Sooke, and Sidney) compared to the higher priced regions (Victoria, Oak Bay, Saanich East, and North Saanich). 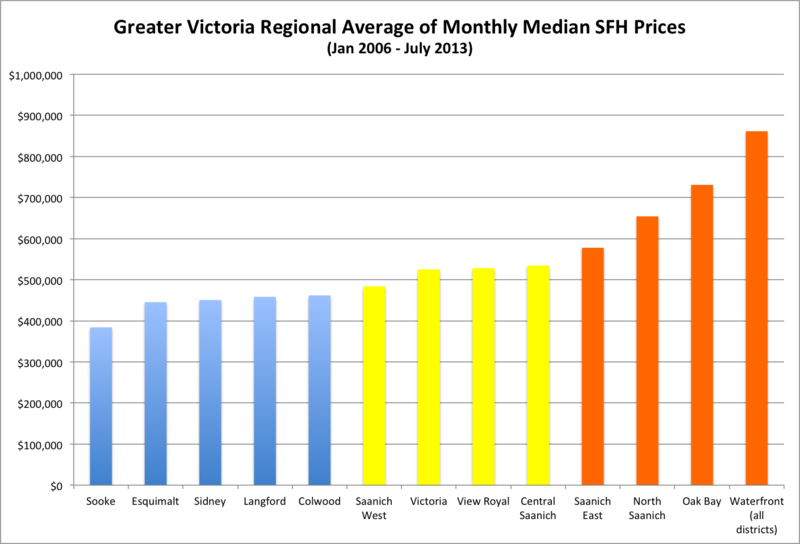 To verify these groupings, let's take a look at the historical prices in these regions. I've removed areas outside of Greater Victoria, as well as the Highlands, Vic West, and Metchosin, which have very few sales (often only one or zero in a month). Going strictly by prices, we can't really include Victoria in the high priced group without also pulling in View Royal and Central Saanich. So I've decided to ditch the middle group and divvy everything up into low and high priced regions as below. The ratio of low end sales is then simply the sum of all sales in the lower priced regions divided by the sum of all sales in the higher priced regions. Let's take a look at how this ratio has behaved in the last 7 years. 1. There is a definite shift after the peak in prices 2010, with the sales ratio dropping some 10-15% from the period 2008-2010 compared to late 2010-2013. This means that before 2010, we would see about 87 lower priced homes sell for every 100 higher priced homes, while after 2010 we are only seeing about 75 lower priced homes sell for every 100 higher priced homes. This matches well with what has been discussed here many times, that the outer areas are suffering more than the inner ones, so far. 2. Average ratio over this period has been 82% (82 lower priced homes selling for every 100 higher priced ones). 3. If the sales mix had not shifted more towards the higher end in 2010, our median prices would now be lower than they are. By subtracting the sales ratio for the month from the "long term" average, we can get a measure for how the monthly median price might be skewed in that month. I call this the skew factor for the month. For example, in July there were 119 sales in the lower end regions and 172 in the higher end, for a sales ratio of 69%. Compared to the average of 82%, the skew factor for July is 13%. This means that the median price for July is likely shifted higher than it would have been if the sales mix was more in line with the average. Let's take a look at the skew factors for the same period. 1. 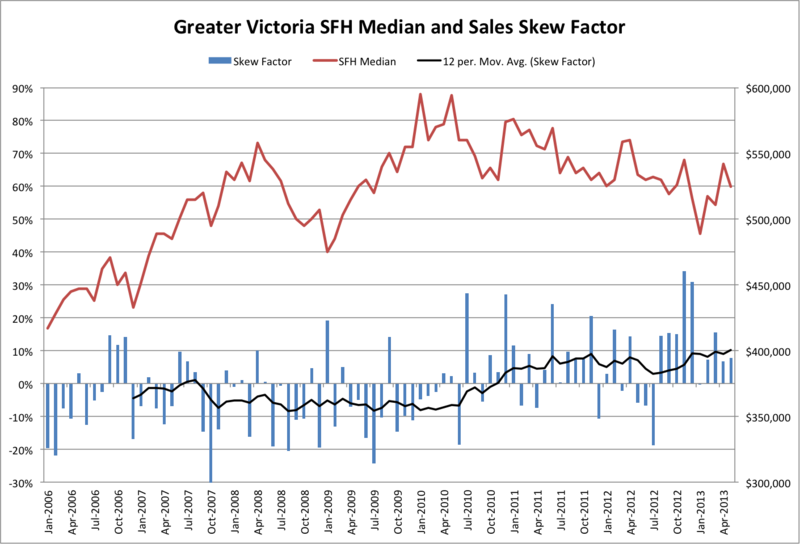 Again we see the strong shift in sales mix between the upswing and the downswing in Victoria's market. I'll hazard a guess that this is due to the credit tightening measures that started in earnest in April 2010 (even though 40 year mortgages were abolished in 2008, the CMHC taps were wide open during that period to compensate). The skew factor moves upward after April 2010 when refinancing was limited and qualifications tightened up. It was boosted some more in 2011, and just as the market was starting to normalize the government kneecapped it again in July 2012, cutting out the first time buyers for a while longer. 2. You can quite clearly see the effect of the mortgage changes last July, with the sales mix strongly shifting towards the high end as the lower end buyers are priced out of the market. This shift seems to have moderated somewhat, but still it has been positive for a year now. 3. January 2013 we had a median of $489,000. The skew factor for that month was exactly 0%. Now one data point is nothing much to go on, but it's an interesting coincidence if nothing else. 4. In general I think we can say that prices are likely down somewhat more than our medians would imply. How much is anyone's guess. Now just because our sales mix is currently more towards the higher end doesn't mean it will come down again anytime soon. However it is another interesting factor to look at to provide more meaning to the monthly stats (which I'll get around to posting one of these days). Update: Closer look at the credit tightening measures effect on the sales mix. The effect from the July tightening does seem pretty clear, with a rush to the exits followed by an anemic low end until now.